In the Big 12’s biggest matchup of the season, the loss may make the Big 12 look worse than it actually is. The Big 12 is still the only major conference that plays a full double round-robin in conference play. No. 5 Kansas faced No. 1 Kentucky in Indianapolis as part of this year’s Champions Classic. The Jayhawks had a lot of trouble going up against Kentucky’s lineup which features at least 10 guys that could likely start anywhere in the country. 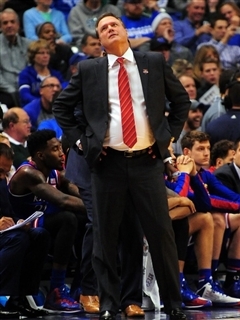 The Jayhawks lost by 32 in their only game of the week. The Texas Longhorns, ranked No. 10 last week, won this season’s 2K Classic in New York City at Madison Square Garden, beating Iowa 71-57 in Thursday’s semifinals and beating Cal in the Championship game, 71-55. The Longhorns have looked great so far this season behind Jonathan Holmes and Myles Turner. Texas has their first test this week, at UConn. West Virginia has looked impressive so far, including a win over UConn in the Championship Game of the Puerto Rico Tip-off on Sunday. Nobody else in the conference did anything too impressive, as the biggest win in the conference was Oklahoma State against Division II Northwestern Oklahoma State in Stillwater.